For the first time I can remember I had MLK day off of work. So after being lazy on Saturday and Sunday, I resolved early on Monday to head out on a long, clear-the-head sort of ride. 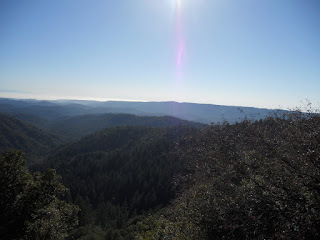 I decided, for no special reason, to take the road bike up to Saratoga Gap, and then ride down to the summit area on 35. Looked pretty good on the map, anyway. Although the weather report promised a warm day, Monday started off in thick fog. I started the ride in a jacket that I was sure was overkill. I haven't used my road bike as much as I had hoped to, and once again was glad to be in the world of low rolling resistance. 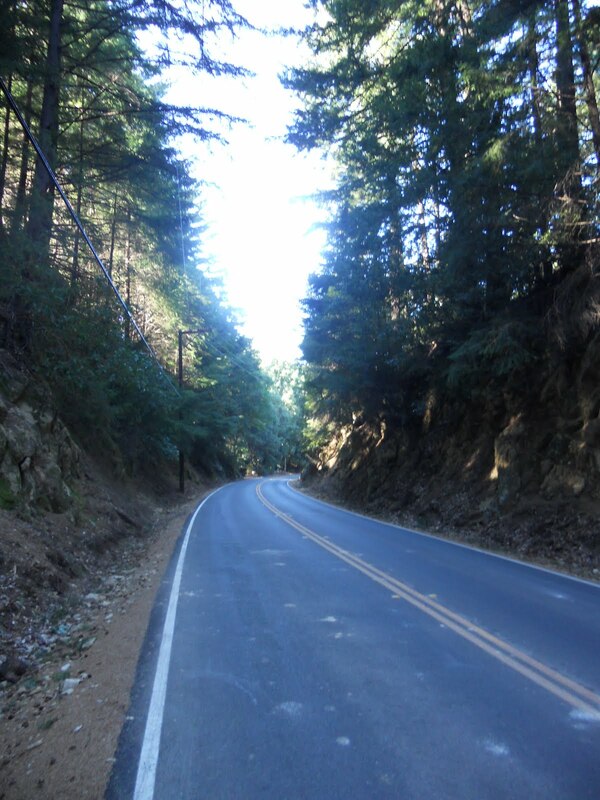 To get to the base of the climb in Saratoga, I took Blossom Hill to Los Gatos, then Route 9 into Saratoga. The climb itself started out well enough, but I soon found that I was having to stop for breath. I haven't been riding much during the holidays, but I didn't think I was in this bad a shape. The problem, I eventually realized, was that I was on the road bike. I normally ride a mountain bike, and climb in a low gear and a high cadence (relatively high, anyway -- I still go very slowly). On the road bike, which doesn't have such low gears, I was trying to spin too fast. So the solution to my problem was: pedal more slowly. Brilliant! The road was wet in the shaded sections, and I must say I worried a bit about the folks descending. I was climbing with my little Garmin thing showing the (highly approximate) altitude, and was trying to remember whether the top of the ride was at 2000 or 2400 feet. 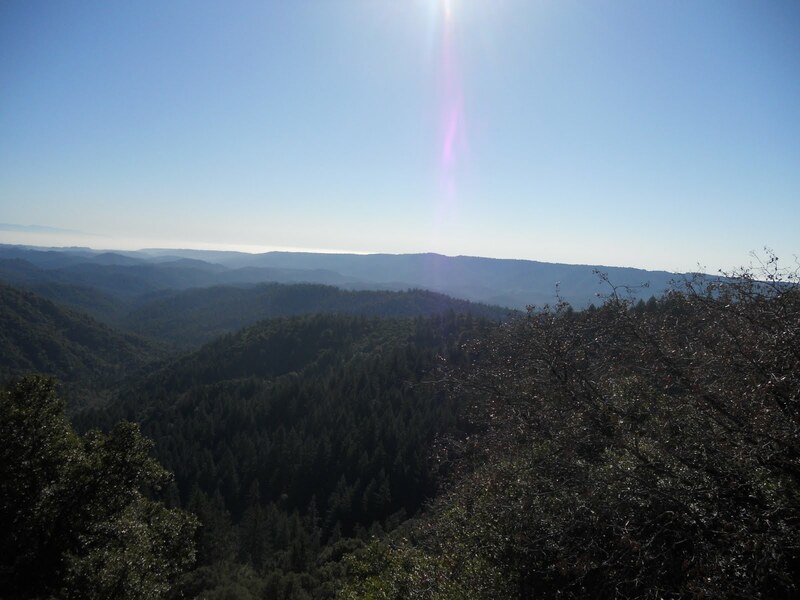 It turns out to be above 2600 feet, and those last few feet were agonizing. There is nothing of intrinsic interest in Saratoga Gap. It's a crossroad where Route 9 meets Skyline, and where you can catch several mountain bike trails (from what I understand, anyway). But there's nothing actually there, apart from a parking lot and a guy selling soda and hot dogs from a cart. My reward for making it this far was a couple of sodas. The normal reward for a climb, the view, is hidden from all sides here. My stay at the gap was short. I finished my sodas and headed along Skyline to the southeast, toward Summit Road. I knew that Summit Road sits at about 1600 feet, so I figured Skyline must head generally downward. I had the endpoints right, but didn't realize that the road climbs up to about 3100 feet before heading down. The slope here was very gentle, though, so while I was going slowly it didn't really register as a climb. Skyline peaks near the entrance to Castle Rock State Park, and the road here is wide and pretty busy. Near the entrance people were trolling for parking spots. 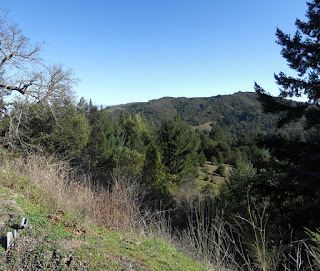 I puffed on by and gratefully began my long descent, past the Christmas tree farms and on toward Summit. There are a lot of Christmas trees growing up here. 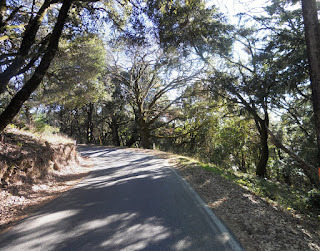 After the intersection with Black Road, Skyline becomes the sort of one-and-a-half lane road that I love riding on. These are old roads, not particularly well maintained, but lightly used. In most spots two cars can pass, but their tires would likely be off the road to either side. At one point a trash truck came along and I almost had to get off the road to let it pass. Often the road skirts around the bigger trees. These are quiet roads, with character. Suburbanization hasn't quite reached them. All along Skyline I was hoping to get a view northward, toward the valley. As far as I could tell, there's no such thing. There are a few nice views to the west and south , but none to the north or east. Skyline meets Bear Creek Road, where it changes from a quaint county road to a two lane, no shoulder, high speed annoyance. I turned right and continued downward, now heading past vineyards rather than Christmas tree farms. The intersection is at about 2200 feet, and knowing that Summit is at about 1600 feet, I was surprised to descent below that point. Ah well, a little more climbing in my future. By the time I blew through 1300 feet, I could smell a rat. Clearly I should have taken a left on Bear Creek Road, not a right. At this point I could either turn around and climb 800 feet to reverse my error, or just continue down the road to Boulder Creek or Felton, and call my wife for a rescue. My legs were pretty burnt but I wasn't entirely worn out yet. I headed back up the hill, lamenting my stupidity. Not for missing the turn, mind you, but for not stopping to check the map earlier. Shortly after my missed turn, a little farther along Bear Creek Road, I turned onto Summit Road, which was again that pleasant rural road. 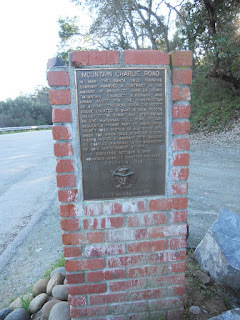 Just before the bridge over I-17 is the intersection with Mountain Charlie Road. Mountain Charlie was, like Jones, one of the builders and operators of a private toll road from Santa Cruz to San Jose. There are lots of accounts of travellers in the 1850s and 1860s spending the night near his cabin, which apparently is about a mile away. From here I went home over the Los Gatos Creek trail, standing much of the time because parts of my body were more sore than my legs, if you get my drift. At the end of the ride, the Garmin showed just short of 60 miles, 5400 feet of climbing, and a whopping 9000 calories. Those last two numbers are undoubtedly inflated, but I was certainly worn out.